Home All Newly Engaged and Wanting to Know More About Ring Sizing? Congratulations on your Engagement! We know you have so many things to do now that you will be planning a wedding, and one of the first things on the list is more than likely having your engagement ring sized. The most common size for engagement rings is a 7, and if you are lucky enough to be a size 7, your ring probably already fits perfectly, however if you need to have your new ring sized, here is some helpful information about ring sizing. The design is one of the most important factors in determining how much a ring can be sized. A simple solitaire ring with a plain shank or band can be sized up or down very easily, because the stone is set on the top of the ring away from the area where the sizing process will be performed. Rings with side stones and accent stones can also be sized, but there are limitations based upon how far down the sides of the ring the stones are set. The farther down the sides and the closer to where the sizing process will be performed, the less the ring can be sized. The type of setting also needs to be considered, rings with prong set stones have a wide sizing range since the stones are set above the shank with prongs and can be easily be tightened if they become loose during the sizing process. Pave set and channel set stone rings have a more limited sizing range since the stones are set down in the shank, and invisible set stone rings cannot be sized. • Stabilizing Beads/Sizing Beads – Beads made of the same metal as the ring can be soldered inside the shank to prevent a top-heavy ring or a ring with a tendency to spin on your finger from spinning. • Ring Guards – A guard made of the same metal as the ring can be soldered on the inside of the shank to make the ring smaller. This is usually used if a ring cannot be sized down far enough to fit the finger using traditional sizing methods. • Spring Shanks – A flexible piece of metal that is soldered on the inside of the shank to make the ring fit smaller. This is usually used when a person has a larger knuckle, the metal flexes out to go over the knuckle and then flexes back for a tighter fit and prevent it from spinning when worn. Whether you need a simple sizing or one of the special services, our master jewelers at MyJewelryRepair.com can get the job done. Our easy online ordering system and mail-in service makes having your ring sized a simple task. 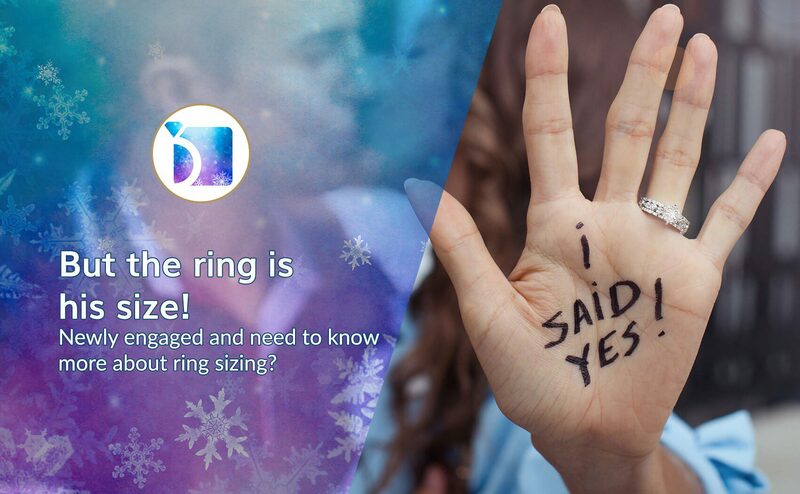 For more information on ring sizing, view our post An In-Depth Look at Ring Sizing or if you are not sure of your ring size view our post How to Get the Perfect Fit – Ring Sizing, and once again Congratulations!